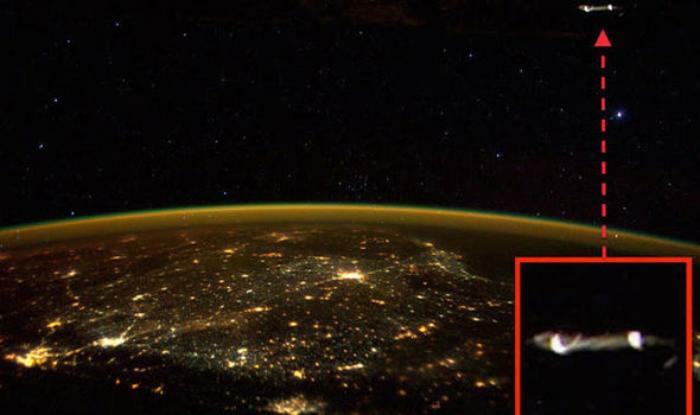 Home » Science News » Did you spot this UFO in Astronaut Scott Kelly's photo of South India? American Astronaut Scott Kelly, who is currently on the International Space Station, recently tweeted an image of southern India as seen from outer space on Diwali night. While the spectacular image is being circulated across social media, alien hunters are convinced the photo is proof of the existence of aliens. UFO Sightings Daily, who claim to have evidence to prove the existence of extraterrestrial life, say Kelly knows about the existence of alien life and that he does not want to reveal it to the public. A mysterious bright object can be spotted in the top right corner of the image, of the Indian Southern Coast, that Kelly tweeted from the ISS at night. TeCake reports that Youtuber Sonofmabarker also uploaded a video titled 'Astronaut Kelly tweets photo of UFO from ISS' which has a zoomed-in version of the image. The video also gives audiences a better look at the two bright objects that have sparked speculation. The narrator of the video claims that there is no way an astronaut of Scot Kelly's calibre would have missed the bright spots in the image. In his tweet, Kelly wrote: "Day 233. Once upon a #star over Southern India. #GoodNight from @space_station! #YearInSpace".